This easy summer salad can be put together quickly and is a great option for summer pot-luck dinners, or to pack to take to a picnic on the beach. Most of the ingredients can usually be found right in your pantry, apart from the fresh greens and feta cheese. Although I used orzo, a small rice shaped pasta, you can really use almost any small pasta shape you choose. 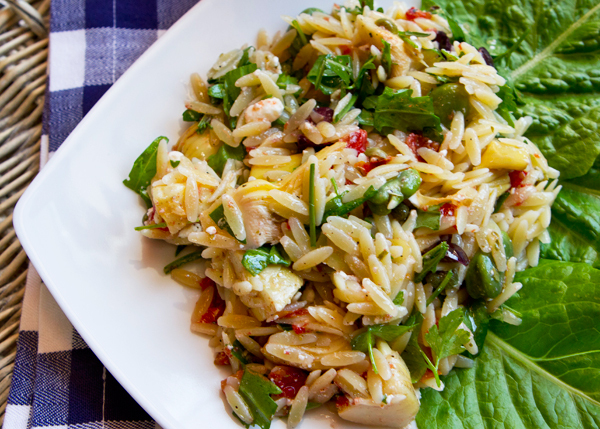 I’m presently in Italy, so am unable to find whole grain pasta, but I’ve made this salad in many variations a number of times in the US using whole grain orzo since I like to use whole grain pasta whenever possible. Some of the ingredients listed in this recipe such as marinated artichokes, oil packed sun-dried tomatoes and black olives might surprise you since you might feel that the added oil would negate any of the nutritional value of the salad, but I do drain the tomatoes and artichokes first, and choose to use ones packed in oil as they have much more flavor. Also, the little oil that still coats these ingredients even when they are drained, means that less oil is needed in the dressing. As well, the amount of black olives used is minimal, and are mainly used to add a burst of flavor to the salad. I have lots of salad greens growing in my garden now, so I chose to use baby arugula as my greens of choice, but baby spinach works really well too! To make this salad a more complete meal in a bowl, you could also add 1 can of drained garbanzo beans. Gaeta or kalamata olives, and olive oil are healthy sources of unsaturated fat. It is thought that eating olives on a regular basis might may help lower your blood cholesterol and help neutralize free radicals that can lead to cancer and other chronic illnesses. Stick to four or five olives per salad though, because they are high in sodium. A small crumble of feta cheese adds a bold flavor to a salad, but is also a nutritious topping. Use a moderate amount of cheese on your salad because while it is healthy, it also is fairly high in fat. Feta cheese will also supply you with calcium to support healthy bones and teeth, zinc and vitamin A, as well as a trace amounts of potassium, magnesium and B vitamins. Arugula belongs to the dark green leafy vegetables family known for its heart-protective and cancer-protective properties. An easy summer salad that includes many common pantry items. Cook the pasta according to the manufactures directions, drain, rinse in cold water and let dry. 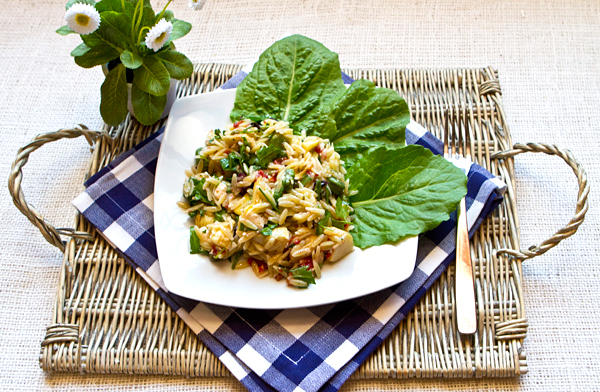 In a large bowl mix the pasta, arugula (or spinach), sun-dried tomatoes, green onions, artichokes, olives, capers, and parsley leaves and toss to mix well. Add the feta and dressing to the salad and mix well.